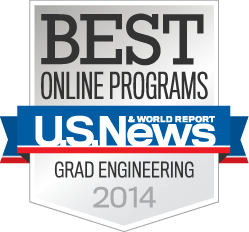 In the new U.S. News and World Report 2014 Best Online Programs rankings, released today, the University of Maryland's A. James Clark School of Engineering is ranked #14 and becomes the latest highly ranked Clark School program to provide outstanding educational opportunities -- and now anywhere worldwide. Many other academic options are offered via synchronous video-teleconferencing at regional education sites throughout Maryland (Aerospace Engineering, Cybersecurity, Electrical and Computer Engineering, Environmental Engineering, Robotics, Software Engineering, and Systems Engineering). The Clark School's advanced distance learning technologies and Seigel Learning Center have been recognized and featured in national publications, including Nature. The Clark School is leading research advancements in aerospace, bioengineering, robotics, nanotechnology, disaster resilience, energy and sustainability, and cybersecurity. From the universal product code to satellite radio, SMS text messaging to the implantable insulin pump, our students, faculty, and alumni are engineering life-changing innovations for millions. Facts, figures, and more information can be found at www.eng.umd.edu.